Give your pooch a healthy, long-lasting chew with the Sancho & Lola's Closet 6" Premium Bully Stick Dog Treats. 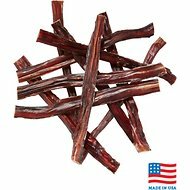 It’s made with just one ingredient―100% all natural beef pizzle from grass-fed cows that are raised in USA ranches―for a high protein, easily-digestible treat your pal will love to gnaw on. They’re hand-trimmed and hand-graded for different size pups so each one is unique, with a tartar-scrubbing surface that helps support oral health and relieve stress. Plus, they’re baked in USDA-approved facilities and third-party tested for safety so they’re great for everyday chewing. Made with all natural beef pizzle so it’s 100% lean, high-protein muscle for long-lasting chewing. Sourced from USA-raised, grass-fed cows with no artificial flavors, colors or preservatives. Tartar-scrubbing and gum-massaging action helps support oral health with daily chewing. Safe alternative to rawhide since it’s 100% digestible without causing blockages, and helps relieve boredom and stress. Made in the USA in USDA-approved facilities and third-party tested for safety; great for small to medium breeds. 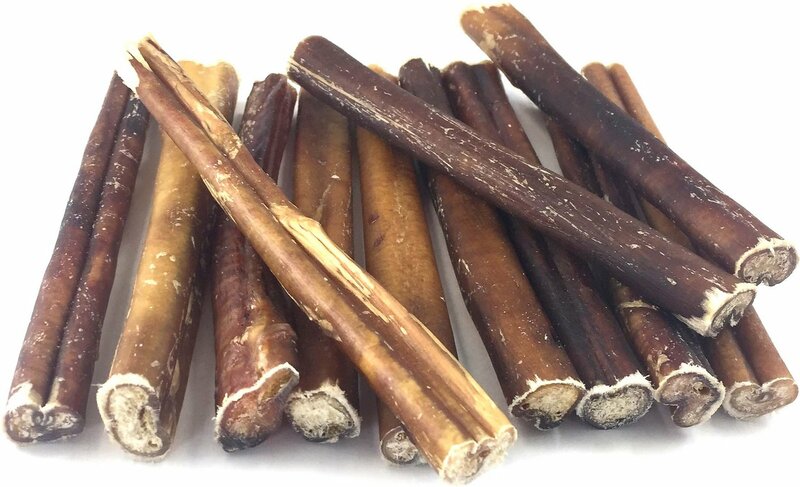 My dog loves bully sticks... but goodness do these stink! It took him about an hour to completely chew this one up but I could smell it for the rest of the day. 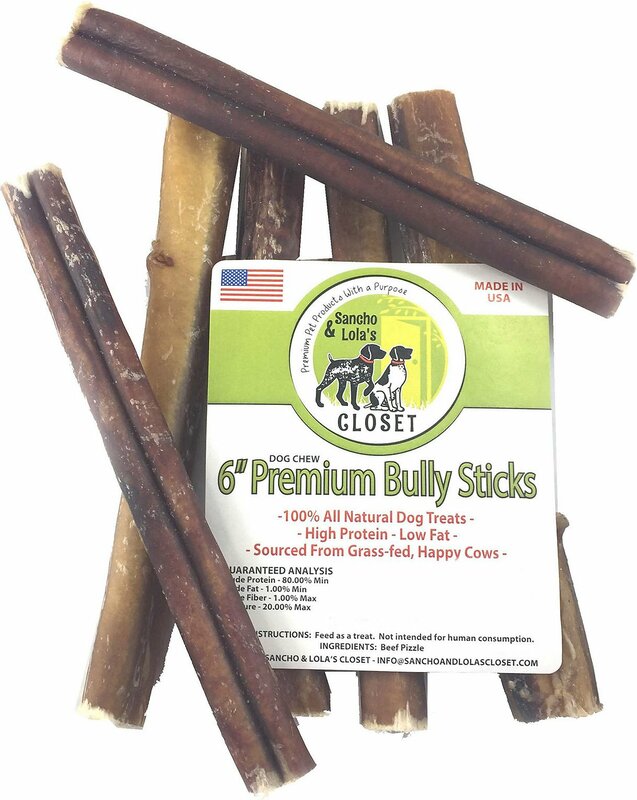 Hands down, these are the best bully stick dog treats. My dog looks forward to getting his "chewer" at the end of each day. He has a sensitive stomach and has never had a problem with these. As with any chewing treat, always monitor your pet's activities to prevent accidental choking. Oh boy does my boy Riley love Sancho and Lola products. I like that they use USA ingredients for their products.I've yet to see him turn down any of their treats. Good stuff. 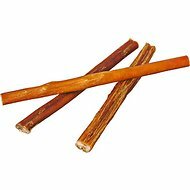 Unlike bully sticks from other (ripoff) places (that last 5 minutes), my boy chomps on these for about a half hour. His favorite daily treat! When you factor in how long they last, they are a real bargain! I bought these because my usual jumbo bully stick was still out of stock. My lab does not like them. Usually she will devour a jumbo bully stick in about an hour, but after giving her the exact same regular size stick for three nights, I threw it away. She wouldn’t eat it! A lab, no less! Last night I gave her one of the previously purchased jumbo sticks that I had and she ate it right up. I guess I have to wait for the previously purchased jumbo sticks to be restocked. It is hard to find a tough chew that doesn’t smell. My dog loves these and they keep her occupied for awhile without stinking up the place! When she get a Bully stick she forgets all her other toys. Stands up to a lot of abuse. No problems with digestive issues. One stick lasts about 2 1/2 days for a 4 month old.